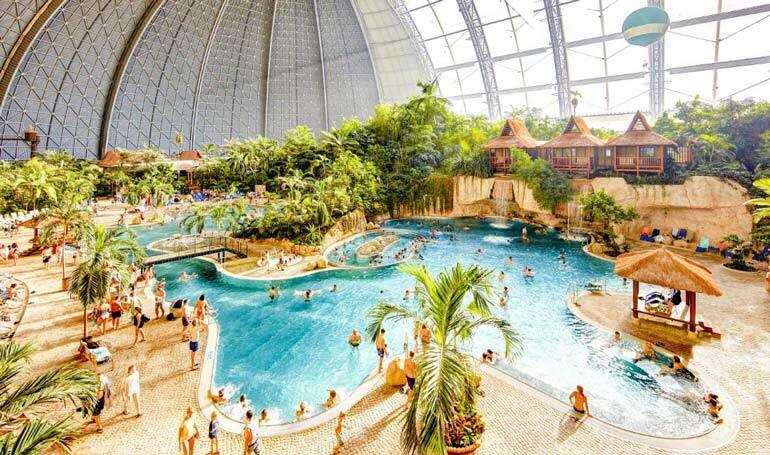 Tropical Islands is huge indoor waterpark 50 km south of Berlin. With a perfect temperature of 26 °C/79 ° F all year round a visit to Tropical Islands makes the perfect day trip from Berlin or Dresden. A perfect spot for an overnight stay if you are craving some sand, water and fun especially on a cold winters day. Tropical Islands holds the record for being the largest indoor uninterrupted space in the world! Housed in a huge dome that was once a hangar for airships. The dome is 360m long and 107m high. 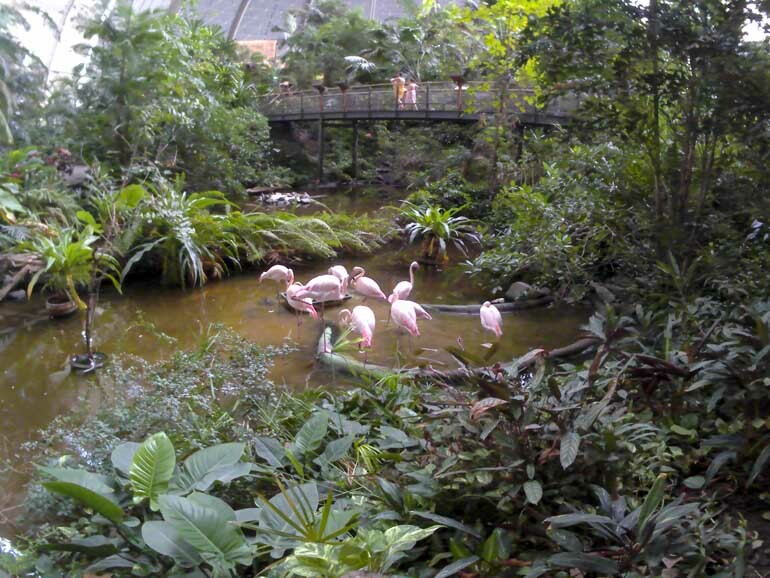 The temperature and humidity are controlled to give and in thousands of plants real sand and even flamingos for the perfect tropical holiday feel. The whole thing is a weird phenomenon and those that have seen “The Truman Show” will know what I am talking about. A huge industrial dome in the middle of the German countryside housing a tropical rainforest complete with birds, plants, swimming pools and real sand really needs to be seen to be believed. The following photos have all been recorded on a cheap action cam using a waterproof housing. While the quality isn’t as good as a GoPro, they are a fun and inexpensive way to take photos and easy to use. There are dozens of brands available on Amazon. 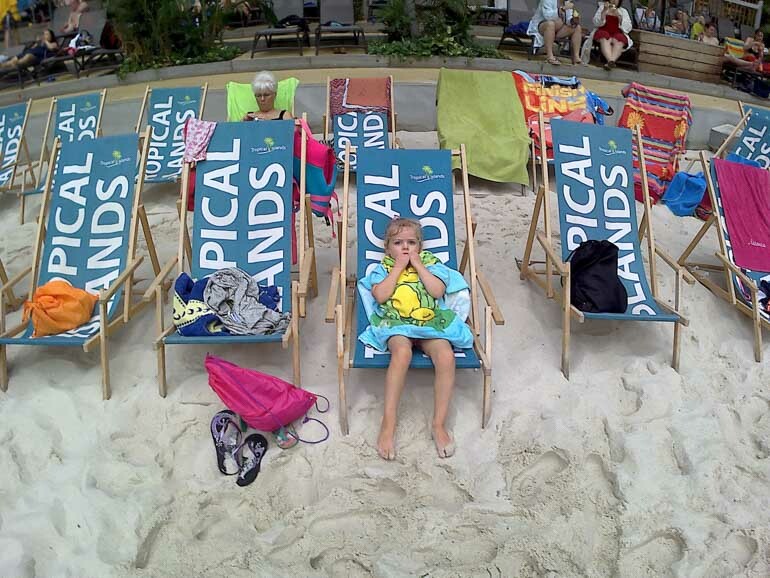 The Tropical Seas area has a 200m long stretch of sandy beach and loungers set up for relaxing and a cocktail bar. A transparent portion of roof allows in some sunlight for those wanting to soak up some rays and boost vitamin D levels. You’ll need sunscreen in summer. There is a large pool area here at 28° C it is more suited for active swimming and you can also try out scuba diving here for an additional fee. At one end is a splash and paddle area for kids with tipping buckets, fountains and space to make sandcastles. With a warmer temperature of 32 degs the lagoon area is surrounded by tropical huts. A waterfall cascades into the pool on one side surrounded by tropical plants. Waterslides and a whirlpool current are fun additions. Tropical Islands boasts the largest waterfall tower in all of Germany, with 4 slides on the tower ranging from family fun to fast thrill rides as well as an additional 2 slides in the Lagoon area and 8 slides on the new Juggle Splash water playground. Tropical Islands Resort is a huge indoor waterpark built inside an old air hanger, it is the largest uninterrupted indoor space in the world. Climate controlled all year round, we visited in January and it was a balmy 26 deg Celcius inside. Amazonia is an outdoor area. Warmed water and revolving swim through doors mean the area can even be accessed on the chilliest of winter days. A raging rapids ride only suitable for strong swimmers is a thrilling addition to the outdoor area. The warm pool has whirlpools and jets as well as some small slides and sunbathing areas that are opened in the summer months. For a few dollars more you can gain access to the Tropical Spa which has a more calm ambience centred around relaxation with saunas, hot tubs, lounging areas, a fitness club and optional spa and beauty treatments. The rainforest in Tropical Islands is the largest indoor rainforest in the world. Home to nearly 50, 000 plants as well as some tropical birdlife and turtles. Hot air ballooning: Maybe not “hot” air ballooning but you can join this strange phenomenon of indoor ballooning. You can hover in a basket at around 60m about ground while an attendant walks you around pulling the balloon from below. Mermaid and Swimming lesson: Kids can take a lesson to learn mermaid skills as well as swimming lessons. 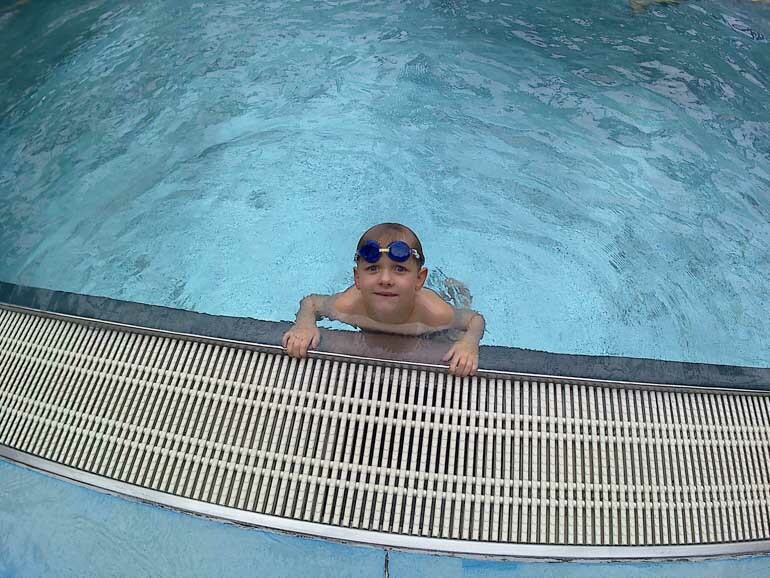 Tropino Kids Club: Want to spend some time out of the water? You can head to the Tropino kids club to play on the pirate ship play structure, ride motorised cars, use bumper boats, play air hockey and more. Various activities are organised for kids to join into however children can’t be left unattended in the club. It is not permitted to bring food and drink into Tropical Islands apart from baby food and for those with medical conditions or allergies. There are several restaurants and cafeterias at Tropical Islands serving a wide range of food and in different price brackets. Compared to food at some of the other attractions I have been to in Germany I thought the food was quite high quality and not too badly priced. I left a chiller in the car with some snacks and drinks for the drive back to Dresden so we only needed to buy lunch while we were there. There is a range of accommodation options within Tropical Islands including tents, apartments and hotel rooms. I haven’t stayed there myself but those that have commented that it is quite noisy during the night. The tents can feel quite humid whereas the apartments and hotel rooms have air-conditioning. There are Airbnb’s in the area as well as a number of other accommodation options in nearby Spreewald. From Berlin head towards Berlin-Schönefeld and join the A 13 road which also goes to Dresden, continue for around 50km south until you see signs for tropical Islands. By public transport take a train to the station “Brands Tropical Islands” from here you can catch a free shuttle bus to the waterpark. The shuttles schedule is matched to the incoming trains. Here is a list of FAQs from the website. The best time to go is when the weather outside is not the best, fall, winter and spring. I’ve heard that the dome can feel too humid and warm in the summer months. Avoid weekends and public holidays like the plague. 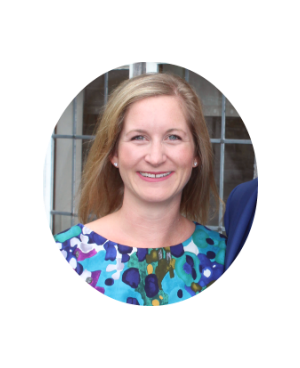 The place can get incredibly busy, if you are planning a visit during these times ensure you arrive early or risk being turned away once they reach maximum capacity. The kids loved Tropical Islands and it was a great way to spend a cold winters day. We drove up from Dresden during a teacher only day at our school. It was midweek and there weren’t many crowds. I bought our tickets the day before to take advantage of the pre-purchase discount. The air temperature was pleasant. The water temperature was nice though could get a bit cool if we weren’t moving around. There was plenty to do to take a break from swimming and the kids enjoyed the play area. The water slides were fun with a good variety for all ages. I would have loved to spend some time soaking in a hot tub and if I went again I would take turns with another adult relaxing in the spa and sauna area while one adult stayed with the kids. 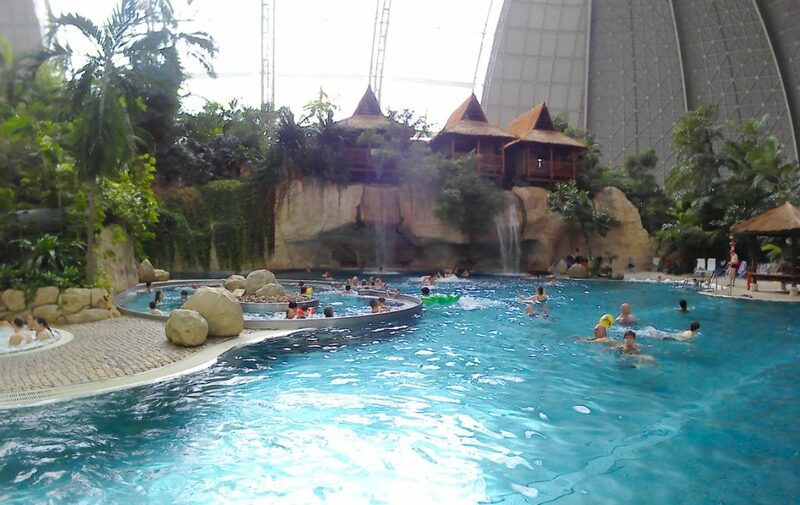 I have also been to Aqua planet in Prague and I enjoyed Tropical Islands more (though it is also more expensive). So should you go to Tropical Islands? 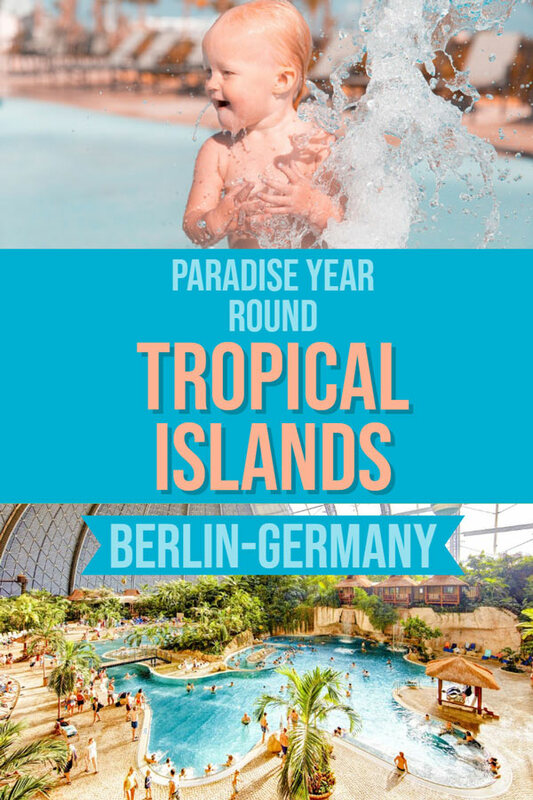 If you live in Berlin or Dresden then yes you should plan a trip to Tropical Islands, it is a unique experience. If you are visiting Berlin for the first time and only have a few days then you should stick to all the amazing sites in Berlin. 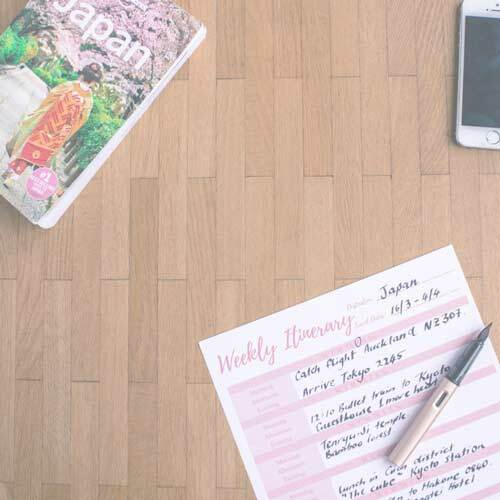 If you are in Berlin for a week or more and travelling with water mad kids and you won’t be heading somewhere tropical any time soon then Tropical Islands could be a fun way to break up your trip. Have you been to any more than memorable water parks? Share in the comments below.